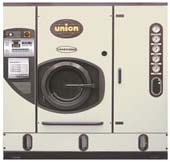 The UNION XL-XP 8012 - 8015 range of dry cleaning machines clearly reflect the results of thirty years experience and leadership in the industry. The concepts of innovation and safety translate into more efficient production, low maintenance and running costs, reduced energy consumption, easy to handle control features and an even more environmentally friendly machine. All qualities which make the UNION XL-XP 8012 - 8025 models IDEAL machines for the professional dry cleaner. These machines are the outcome of a project built on many years of research and development, the latest dry cleaning technology in a reduced area, designed especially for shops where every inch of space is important. All this translates into low installation and running costs and establishes new standards of quality. From the innovative DIALOG computer to the advanced IDROMATIC eco-friendly still cleaning system the UNION XL - XP 8012 - 8025 gives new meaning to the words Fast, Efficient and Clean. Whichever model or version you choose from the new Union XL-XP 8012 - 8025 range, it is sure to be the ideal system for you. The UNION L-P 800 range of dry cleaning machines clearly reflects the results of thirty years experience and leadership in the industry. The concepts of innovation and safety translate into more efficient production, low maintenance and running costs, reduced energy consumption, easy to handle control features and an even more environmentally friendly machine, all qualities which make the UNION L-P 800 models ideal machines for the professional cleaner. These machines are the outcome of a project built on many years of research and development, the latest dry cleaning technology in a reduced area. All this translates into low installation and running costs and establishes new standards of quality. High cleaning quality and best performances in energy consumption and ecology. From the innovative DIALOG PLUS computer, the new ITDS drying system, to the advanced IDROMATIC eco-friendly still cleaning system. High-efficiency pumps, industrial grade stainless steel and brass in all critical areas of the UNION L-P 800series give new meaning to the words Fast, Efficient, and Clean. Whichever model or version you choose from the UNION L-P 800 range, it is sure to be the ideal system for you.